So I admit that I was quite intimidated by this challenge. 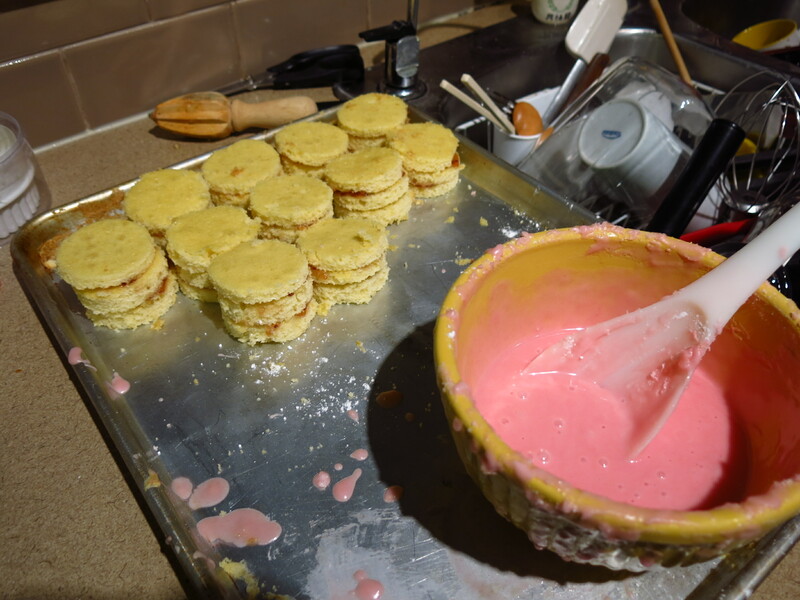 The last challenge of the Cake episode was to make 36 miniature “British Cakes”. 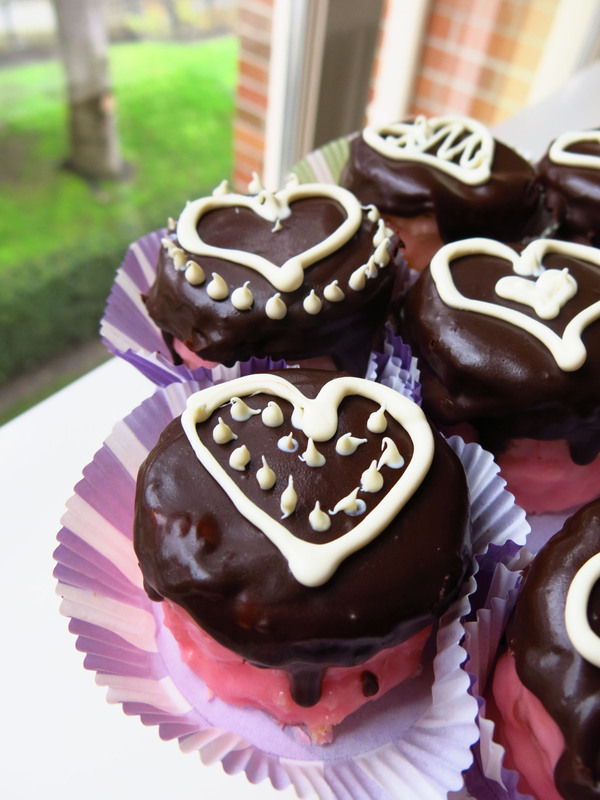 I assume that cupcakes are probably a no-go – so off I went to make some cakes! The competitors on the show had some beautifully intricate cakes. I knew right away that I would have to keep it pretty basic. I don’t have the time or resources to do 36 mini mousse cakes, so I went with a stacked and glazed cake. My inspiration was the Lamington, an Australian petit fours that I have always wanted to make. 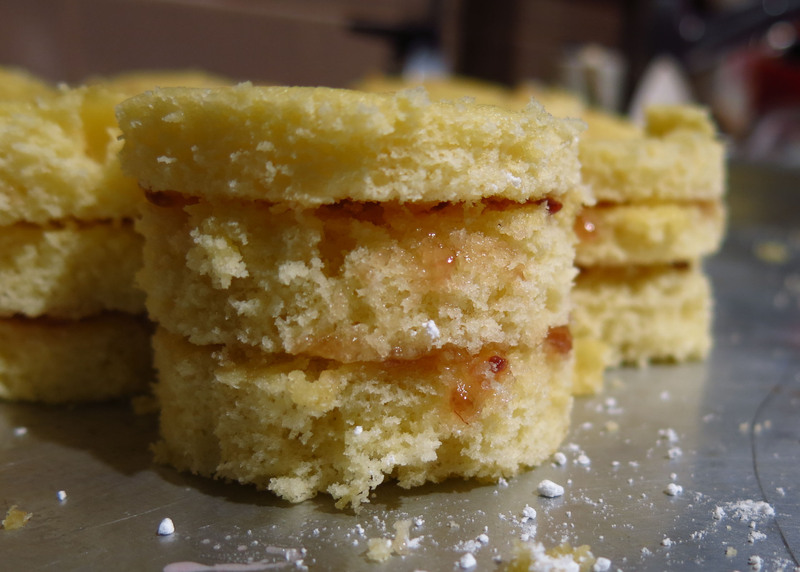 It’s a dense white cake sandwiched with jam and then dipped in chocolate (all sides) and then tossed in coconut. Doesn’t it sound amazing?? And difficult to make?? 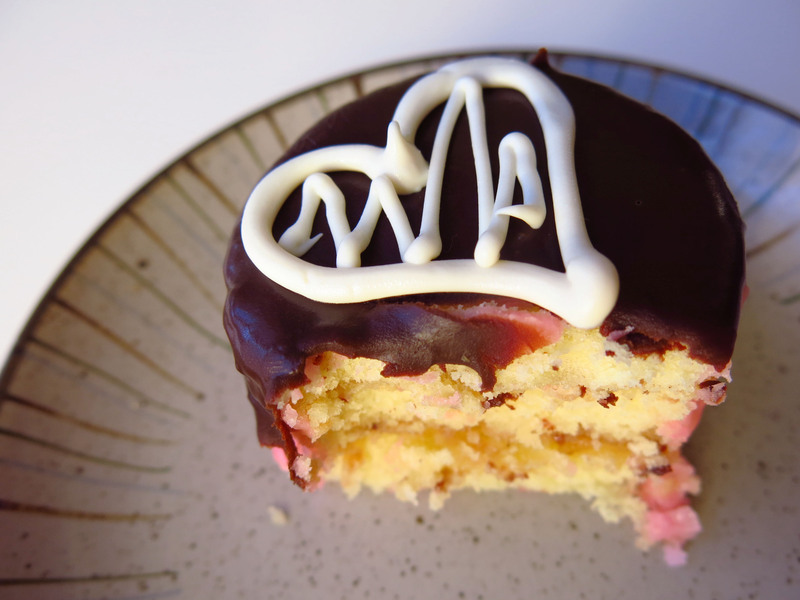 I went with a basic yellow cake, 3 layers sandwiched with jam, dipped in a pink glaze and then topped with a generous glob of ganache on top. I have to say that I failed on this challenge pretty quickly. I only made 34 cakes. Oops. I made three sheet cakes and the first one, as I was taking it out of the oven, slipped out of my hand and about 1/2″ of cake was ruined. That 1/2″ was the difference between 34 and 36 cakes!! Technically I could have made 35 cakes, but I was so exhausted, I decided to go with 34. So as I mentioned, I made 3 sheet cake layers in half sheet pans. I learned a key lesson for my oven – bake one sheet at a time. There’s something about doing two sheets at once – it doesn’t rise quite a nicely (the heat is probably uneven). So I wound up with one beautifully fluffy sheet cake and two so-so cakes. I used a 2″ circle cutter to punch out all the rounds and I got to sandwiching them with raspberry jam. After they had been sandwiched, I let them chill in the fridge for a few hours. The setting of the cakes and jam helps when I dipped them in the glaze. I’m happy to say that they all stayed stacked, but I had many bloopers and dropped the mini cakes in the bowl of glaze many times. I also grossly underestimated how much glaze to make and had to make a few batches along the way. The key disadvantage here is that the colour between the batches is a tad inconsistent (it was very close). After all the cakes were dipped and glazed, they were put back in the fridge for another chill. This gave me the opportunity to make a dark chocolate ganache – I use a very basic formula: 1 cup of cream + 8oz of chocolate. Feel free to add in a generous dash of espresso powder or other liqueur. 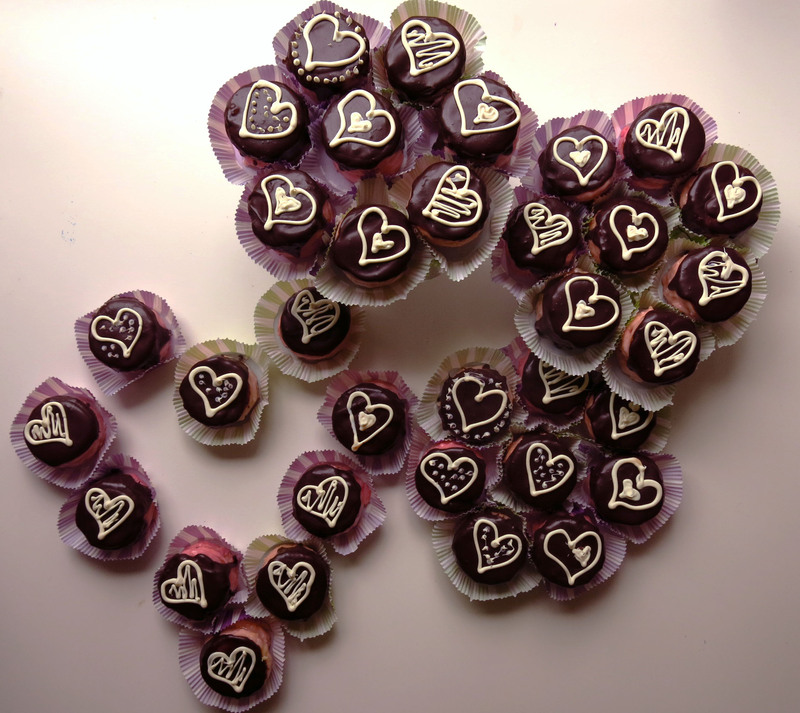 I took out my army of mini cakes out of the fridge and globbed on a generous dollop of ganache on each. 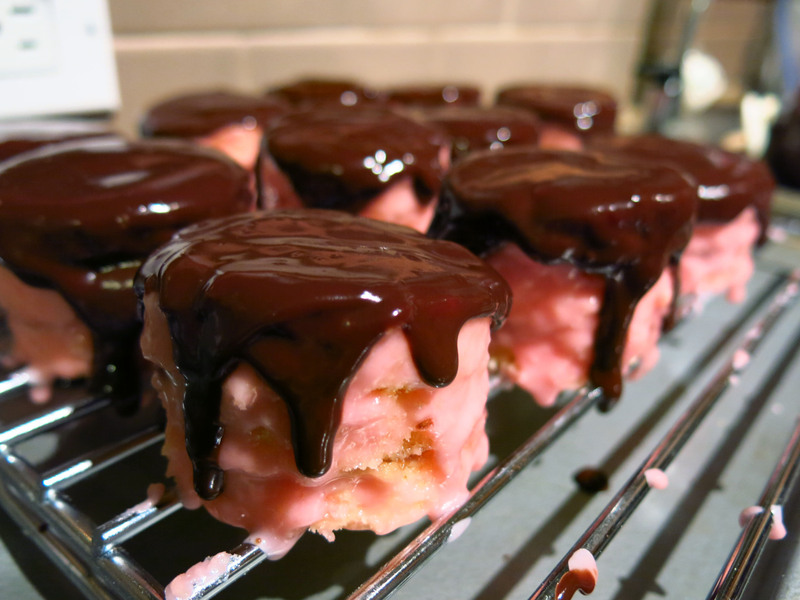 I didn’t pipe on the ganache because I like the “drippy” look. Off they went back into the fridge for a final set and the next day, I melted some candy wafers and piped on some Valentine’s Day-themed flourishes. As they were distributed to many people, I also put them in low and wide cupcake liners (for transportation purposes) – but I did love the look of some of the competitor’s cakes that used foil mini boards. Some pretty purple (and also green) cupcake liners to help with transportation. That’s a lot of cakes. A nice shot of my afternoon snack. So this challenge was definitely…a challenge. Time, resources,…everything. I think for me, I don’t know if I would make these again. It’s such a balancing act of flavours and sweetness. I felt like they were sooo sweet – they were all dipped in glaze! I think if I were to do mini cakes again, I’d rather invest in acetate and do mousse cakes or a formed and chilled cake (oooh mini zuccottos!) rather than a stacked one. And I only made 34!